Stock #S109SS:Exquisite Sterling Silver Matching Set with one of our 1.25 carat Russian CZs and 1/2 ctw of side stones on band. 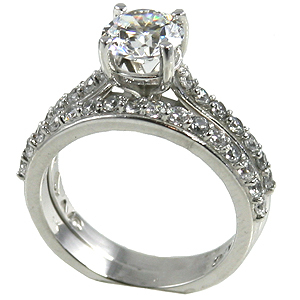 Can also be left blank to set with your 1 or 1.25 carat stone, Sizing charges include both rings. Add an extra band for the other side! Available with larger and smaller center stones by special order.